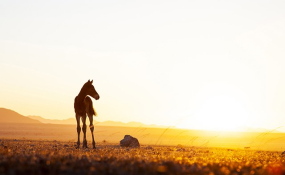 The feral horses of the southern Namib are in danger of extinction. The Ministry of Environment and Tourism has come to the rescue of feral horses of the Namib-Naukluft Park which are on the verge of extinction because of predation by hyenas. The ministry's chief public relations officer, Romeo Muyunda, yesterday told The Namibian that they have prioritised the safety of these horses since they became aware of their predicament through the Namibia Wild Horses Foundation. "We have committed ourselves to capturing and removing the hyenas since last year. We started the process in December, but our efforts were hampered by the fact that staff had to go for holidays. Now that the staff members are back in the field, they are working on capturing the hyenas so that they are removed from the Nauklauft park," he stated. Nature conservation foundation Gondwana Collection's managing director, Manfred Goldbeck, yesterday told The Namibian the ministry had acknowledged the value of the Namib horses for tourism, and as a national heritage. The foundation has appealed for several years to the environment ministry to manage the hyenas, or grant the foundation custodianship to move the horses to a safer home. "The ministry released a statement in December 2018 that they would relocate the hyenas, and affirmed that it would ensure the horses' survival, which was a positive thing, but their attempts to bait the hyenas proved unsuccessful," Goldbeck explained. He said a month has since lapsed with no action taken, and the hyenas are again voraciously predating on the wild horses. The Namibia Wild Horses' Foundation said in a statement released on Tuesday that the population of the horses in the park is on the brink of extinction, and the situation is dire. Since 2012 when a pack of spotted hyenas moved into the area and began preying on them, the population has plummeted from 286 to a mere 79 horses. In 2013 alone, the hyenas killed a hundred horses, 50 of them foals. The foundation also said new life once again graced the Namib Desert after the rains of May, as the condition of the horses improved, and the first foals were born. "It was not long before the hyenas returned to Garub, and the brief glimmer of hope was soon extinguished. "All the foals born in the last few months, except for one, have been killed. But a few of the Namib mares are expecting, which is our last hope," the statement reads. "We are now in the final hour of the wild horses' existence on the planet. Without the chance for new life, the population is doomed. The last foal remains on the desert plains, and any day could be its last, ending the hope of a new generation," the foundation said.